Share Our Strength, a Washington D.C.–based anti-hunger organization, has big plans for Dine Out for No Kid Hungry: to end childhood hunger in America by 2015. To achieve this goal, Share Our Strength enlisted the help of 4,000 restaurants, many independently owned, across the United States in 2010. Together, they raised $1.5 million. Cause marketing programs varied by business, but point-of-sale and purchase-triggered programs were particularly popular with restaurants of all sizes. 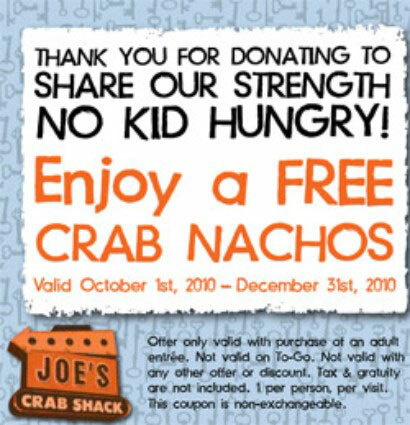 For example, during September, Joe’s Crab Shack restaurants gave one order of key lime pie to customers who donated $1 and one order of crab nachos to customers who donated $5. The restaurants added to their donation by giving the proceeds from their signature T-shirts to No Kid Hungry. The cherry on the . . . umm . . . crab cake, however, was that Joe’s matched the donation bringing their total gift to $325,000. Joe’s Crab Shack thanked donors with either key lime pie or crab nachos. Yum! Local restaurants, cause marketing, and matching gifts? Dine Out is one dish you have to love.